This is the list of 151 Classmates from the Sequoia High School Class of 1960 who have been reported as deceased. The latest, Tom Randlett (of the Randlett twins was lost to us on August 14 as we gathered for our 55th Class reunion! And William Michael Black pased away in idaho on Sept 5. Two of the classmates listed, Ken Quinn and Peter Friebel, died while on active duty in the military. 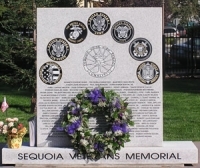 Their names are engraved on the Veterans Memorial on the Sequoia High School campus. which is pictured above. If you know of anyone who was in our class in any of the 4 years and who is now deceased and not listed below, please let us know. We want to remember all the classmates who enriched our lives and are now gone.